Now that we are moving into the autumn the weather is sure to become a little more unpredictable. There is no better time than to ready ourselves for bad weather and cold conditions, with our horse stables being at the top of our list. The basic rule to follow is to prepare for the worst! The unexpected heavy snow earlier this year caught many of us off guard and brought much of the country to a grinding halt. If this should happen again, you need to be sure that your stable can run on the supplies you already have, as deliveries may not be able to get through for some time. We’ve put together some of the main things that you can do now, in order to prepare for such occasions. Check the electrics in your stables and paddock areas. They will have been used much less during the summer months and may have blown bulbs or fusing, which will need to be dealt with before the evenings start to get darker earlier. Review your lighting needs. Do you need to organise extra lighting this winter? Ensure that all walkways and stables are well lit and have a backup plan if the power should go out, such as a supply of battery operated torches and lanterns within easy reach. Eliminate any drafts. Inspect the stable buildings and make sure that any holes and gaps are filled in, as a horse will feel the cold more when a draft blows through. Check the guttering. Make sure that it is clear and free of damage. If we should get heavy rain and it is blocked or broken, it will concentrate water into one area and result in a muddy bog that will spread. Insulate any water and heating pipes. This is easy to do, with lagging from a DIY store or with old duvets and string. This will help to ensure that your horses always have enough water and heat if we should get another big freeze. Have a pest control plan. Rodents also want somewhere warm and dry to sleep in the winter, so have a regular check around for any evidence of these uninvited guests. Keep extra food stored away in sealed containers and invest in some control methods. The Big Cheese Rat Cage Trap is the perfect tool for relocating any pests. Add rubber mats to the floors of your stable. This will help to keep your horse’s hooves off of the cold floor and out of the mud, where it may cause them damage. Order your grit now! If bad weather hits, this will be in short supply very quickly. You may even save money by purchasing it before winter. Have a good supply of hayage. Again this may be harder to come by as the winter season descends. Stock up now and prevent any panic later on. Stock up on bedding shavings and straw. When the bad weather hits us unexpectedly, it is good to have extra bedding on standby, available to give your horse some extra warmth at a moments notice. Build a supply of food and treats. 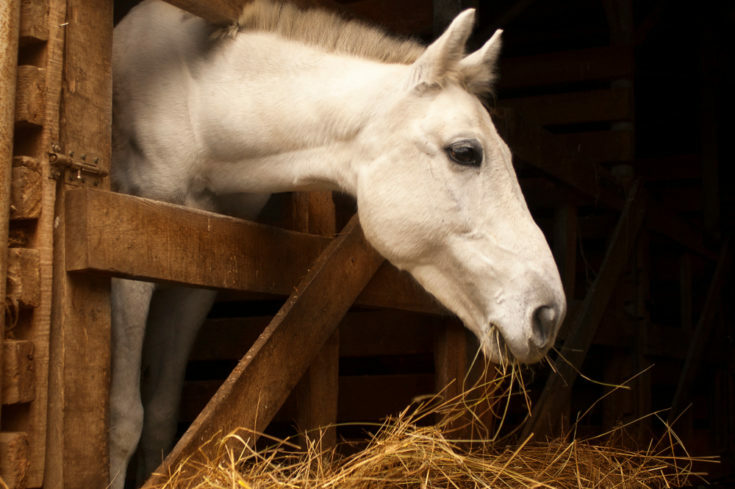 If you are unable to get to a feed store or if delivery drivers are unable to tackle icy roads, having a backup of extra provisions will be crucial to your horses wellbeing. An Uncle Jimmy’s Licky Thing Horse Treat Refills tub will help to treat your horse, on days when they may have to stay inside. Inventory your own stable wardrobe. Do you have enough warm clothing to get you through a freezing cold day and possible evenings at the stable? Ensure you have some hi-vis items too for foggy days and dark evenings when you take your horse for a walk or ride. A Harry Hall Hi Viz Gilet will keep your warm and seen. Ensure you have enough water and feed buckets. You may need replacements if buckets are damaged by the wind or freezing conditions, as well as fresh ones for when icy buckets are defrosting. A Prostable Flexi Feed Tub is durable and resistant to frosty conditions. If you get ahead and plan early for the colder, harsher weather, then you should have fewer problems when it finally arrives. It is likely that you already work on maintaining your stable throughout the year, but a little extra thought as the seasons start to change will make all the difference if our unpredictable British weather takes hold.